There is plenty of talk in regards to when the Old Highway 49 Bridge will be exposed. 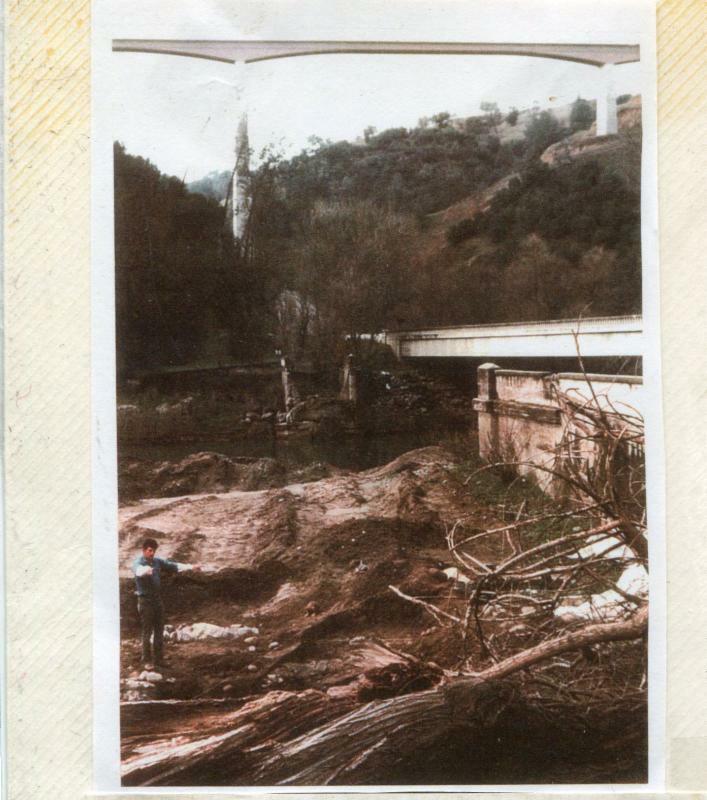 Here is the first bridge that was built and washed out. This picture was taken from the base of that original bridge. To the right is the Old Highway 49 Bridge and off in the distance is the new Stevenot (Hwy 49) Bridge. 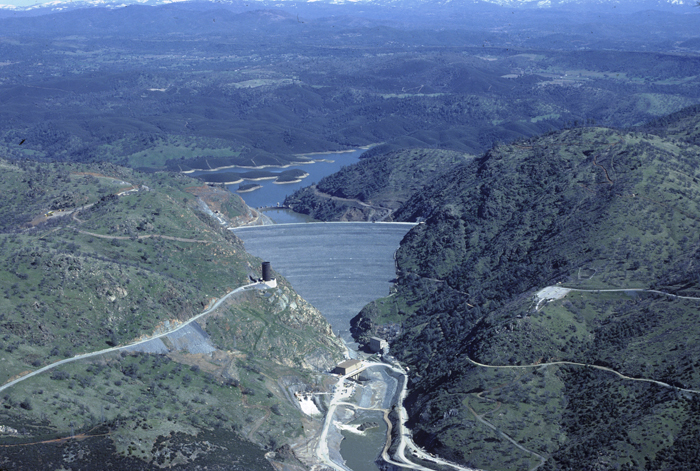 Here is a photo from 1993, the lake was at the lowest point since construction of the new dam. 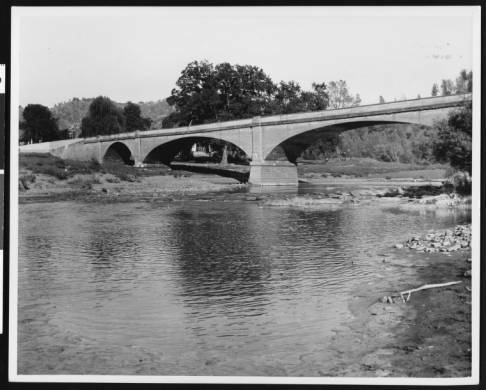 In the middle of the photo is the Old Highway 49 Bridge and it shows that it is not a very tall bridge. On the far right is the new Stevenot (Hwy 49) Bridge. In this photo the reservoir elevation was 722′. 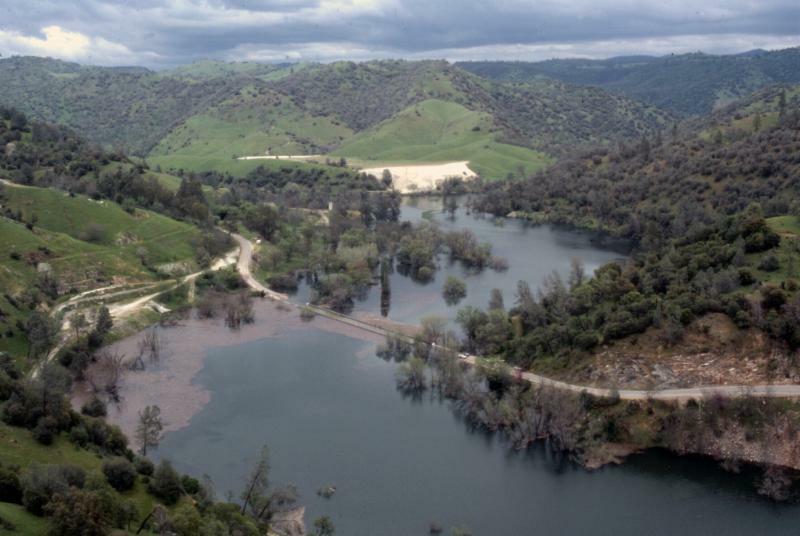 The current reservoir elevation is 847′. This photo was taken on May 26th, 2015. This last week we used sonar and GPS to try and locate the top of the bridge. The main river upstream of the Old Highway 49 Bridge is approximately 145′ deep. We followed the river downstream, as we crossed the bridge the sonar jumped to 110′ then went back to 145′. The Old Highway 49 Bridge has approximately 100′ of water over the top of it. With that being said it should surface at approximately 747′. Here is the Old Highway 49 Bridge slightly submerged as the lake started to fill. 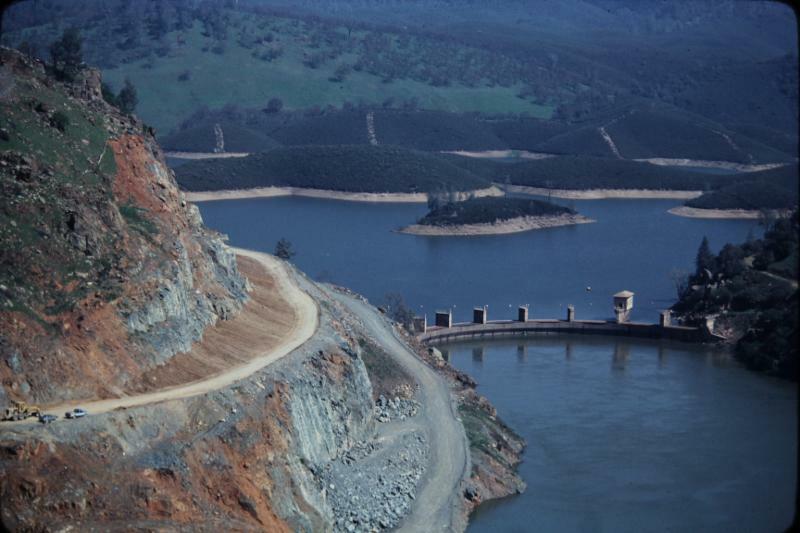 The old Melones dam would spill when the lake elevation reached 735′. 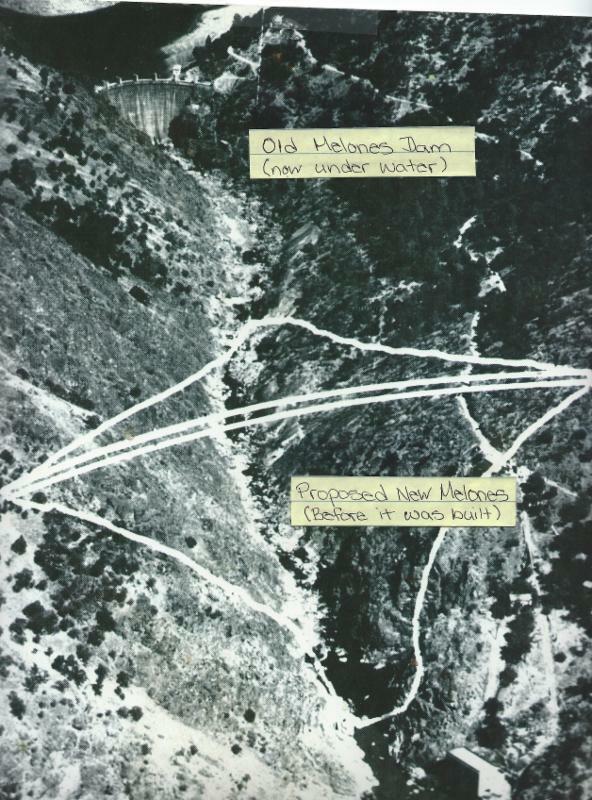 Here is a picture of the old dam and the proposed location of the new dam. 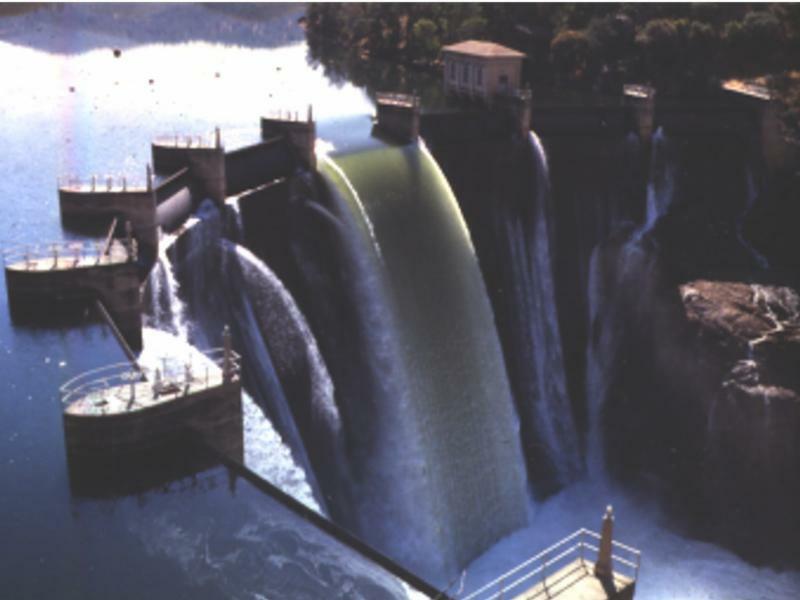 This is a photo of both the new dam and the old dam. This shot was taken from the new dam looking down at the old dam as the new reservoir was being filled. 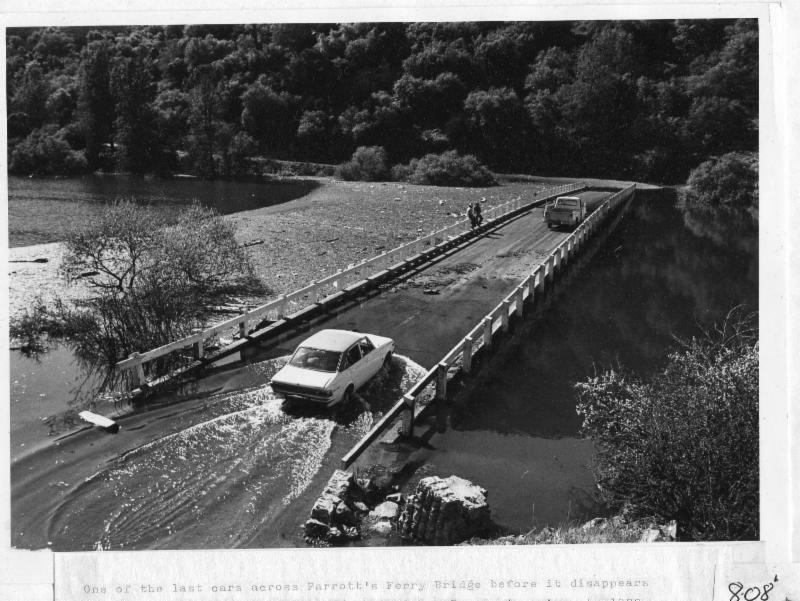 This photo is the Old Parrots Ferry Bridge as it started to go under. The Old Parrots Ferry Bridge, upstream from the new one, now has buoys on it and is just barely underwater. We can expect to see it exposed in the next couple of weeks. 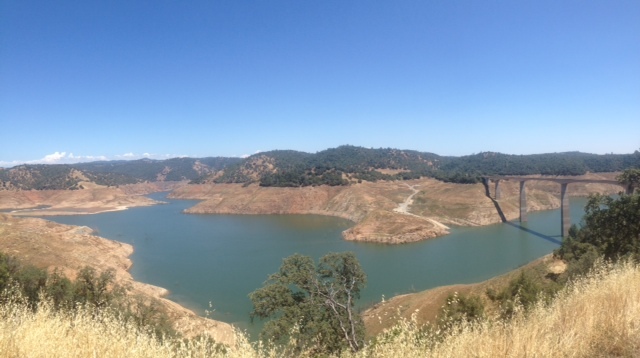 If anyone would like to share any additional photos the lake during the last drought they would be much appreciated.